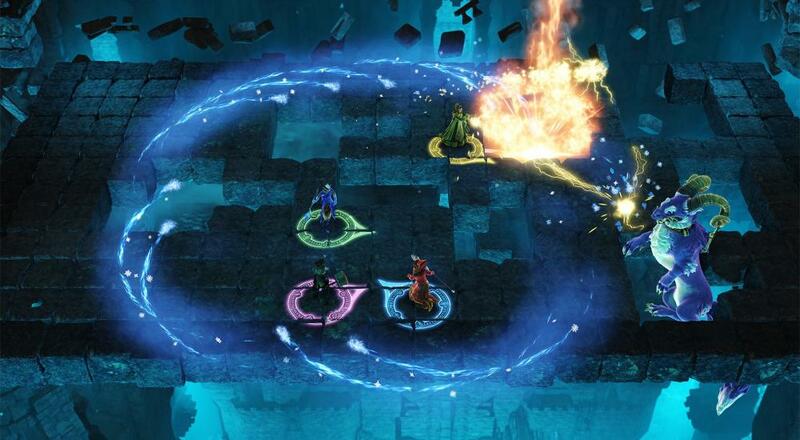 After getting teasers for the past year, some details have emerged about the underlying mechanics for Frozenbyte's forthcoming "cooperative blast 'em up," Nine Parchments. Each of the eight playable wizards will have their own set of skill trees into which players can dump points into as they earn experience. There are also magical staves you find in the world that will open up new areas or give you a new quest to undertake. Character skill trees are tuned to the strengths of a particular wizard. For instance, if you're playing Carabel the Glacial, your skill trees will focus around ice spells. The Mechanical Owl enjoys lightning/electricity so much of his tree enhances those spells. While the skill trees may boost certain aspects/attributes of a wizard, all of the wizards will have access to a wide-range of spells across the six different element types (fire, ice, lightning, steam, life, and death). Also, much like Magicka, players can combine spells to create new spells/effects. As I briefly mentioned before, there is also loot to be had in the world of Nine Parchments in the form of hats and staves. The hats are purely cosmetic so you can have the best looking wizard on the battle field, but the staves will have some impact on the game itself. Nine Parchments will support four player local and four player online co-op when it gets released sometime in December on the PC, Xbox One, PlayStation 4, and Nintendo Switch. If you do own a Switch, then you can play through a limited demo of it right now. The demo has only three playable levels, and all of the progression is disabled along with online co-op, but you can play it with four friends locally. Page created in 0.7856 seconds.